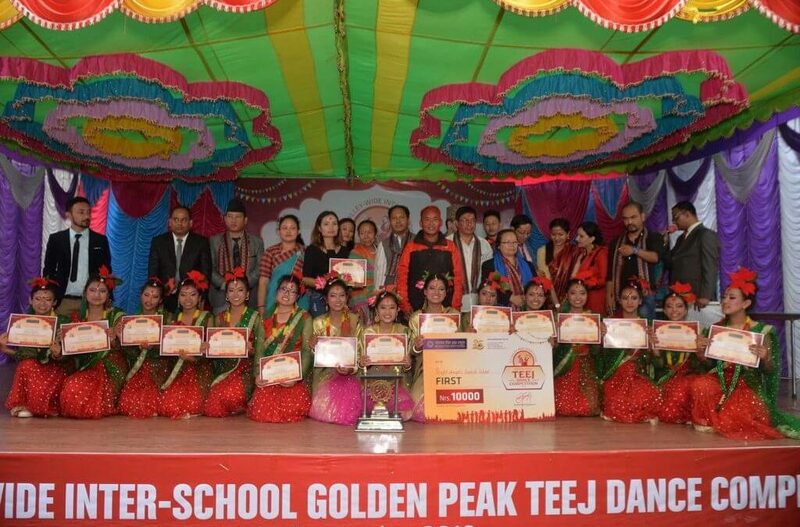 On the occasion of Teej festival, a grand Valley-wide Inter-school Golden Peak Teej Dance Competition was held at Golden Peak School. Among 29 participant schools, Bright Angel, AIA and Srijana Gyansagar bagged trophies for first, second and third positions along with the cash prizes of Rs 10,000/-, Rs 7,500/- and Rs 5,000/- respectively. The organizer GPHS has only performed dance without taking part in the competition in order to create fair environment for the competition. In this competition, ten top schools from 4th to 10th were awarded with trophies and certificates along with the certificates to all participants. The prizes were distributed in the presence of Honorable Tham Maya Thapa, minister for Women, Children and Senior Citizens, as the chief guest of the program.